↑ Smuts, G. L. (1982). ببر شیر. Johannesburg: Macmillan South Africa, 231. ISBN 0-86954-122-6. ↑ شیرs-nocturnal-chorus ببر شیرs' nocturnal chorus. Earth-touch.com. Retrieved on 31 July 2013. 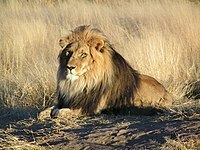 ↑ African ببر شیر Panthera leo. Phoenix Zoo Fact Sheet.